Annie and The Ritz discuss their upcoming Road Trip. Well, the dust is settling on our carma. With yesterday's departure of Samantha for The East Coast we're down to "only" four vehicles. Here's how our carma shakes out or shapes up for now. Marvie, the 30-year-old Nissan 720 4WD king cab pickup. Sitting in Arizona storage at Brad's Place, we have Snappy, the 1994 Nissan short bed regular cab 4-cylinder pickup. The average age of our four vehicles is now 22.5 years. As far as our ownership goes Annie is the Elder Stateswoman. We bought her in June 2001. Snappy was acquired in January 2006. Marvie came on board in May 2013 and Seren is the Baby of the Family as she's only been with us since March this year. For six months during our Idaho Season, we have three vehicles on insurance. When we are in Arizona, we now have only two vehicles on insurance. Likewise, we are now only taking Annie back and forth between Arizona and Idaho. By dropping down to just four vehicles, we are saving over $600 a year from our previous out-of-pocket cost. Bear in mind that our insurance costs are minimal. Really old vehicles can be typically insured for $20 a month, $25 tops. Our total annual insurance cost for four vehicles is an approximate grand total of about $800 a year or roughly just a little over $2 a day. Compare that to your own typical auto insurance bill. Yes, it takes a LOT of fuel to move Annie towing The Ritz north and south. Annie's gonna be lucky to get 12 miles per gallon out on the highway. This trip, she's really gonna be loaded so 10 mpg sounds fair. It's 800 miles so that's a max of 80 gallons of fuel. Anything less is a big bonus. OK, how much is 80 gallons of regular unleaded these days? Well, here in Idaho Falls, it's 3.47. GasBuddy sez that's probably 10-20 cents higher than we're going to pay as we get farther south. Plus, gas prices are dropping. So, barring unforeseen Middle East turmoil, we can expect to pay $3.50 or less a gallon. Eighty gallons at that price would be $280. If we get lucky and the average is, say, $3.35 then our cost would be $268, a difference of only $12. So, it's kinda splitting hairs. Just figure $300 (rounded) for the cost of fuel now to travel to Arizona. Bear in mind that we save $1200 by not living here during the winter months. Yep, that's how much our utility bills would be. Since we're not taking Snappy back and forth, our cost of traveling to Arizona has dropped to an All Time Low. If you think $300 is expensive to drive to Arizona, consider the cost of FLYING to Arizona. 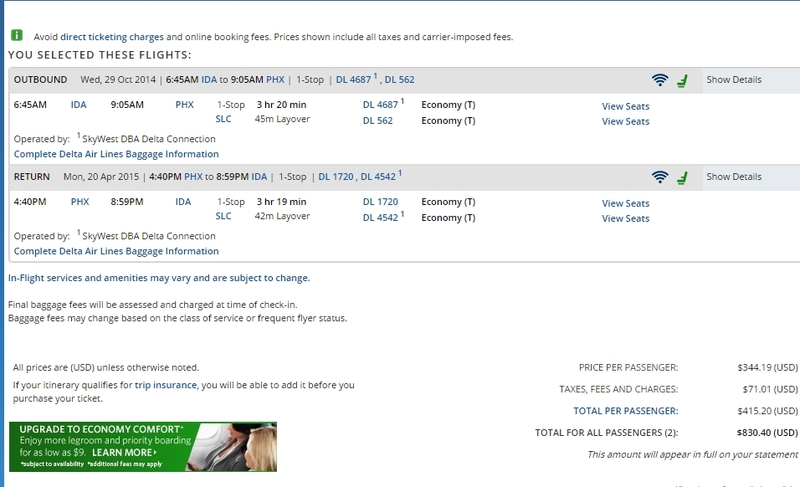 Without fees for checked bags, one way for two people just to Phoenix would be over $400. Now, add in rental car fees to get to Rimrock and you're probably looking at $500, just to show up with a mere couple of bags. For the mere cost of $300, we get to carry ALL kinds of stuff down to Arizona, PLUS have a nifty travel trailer, too. Yeah, $300 sounds expensive UNTIL you compare it to other stuff. To us, $300 is a bargain. When we are in Arizona, we will have only two vehicles--the 1994 Nissan (Snappy) and the 1993 Big Chevy (Annie). Obviously, we don't plan on driving Annie much while we are there. This will further reduce our fuel costs while we are in Arizona. Anyway, yesterday's departure of Samantha really cleared up our carma and we are Happy Campers. Nice post JP....looking forward to our upcoming road trip.